Retinal detachment is an uncommon eye condition, but is one that strikes fear because of the relatively rapid progression towards blindness if not treated appropriately. It occurs in around one in 15,000 people annually. This equates to around 20,000 Americans yearly developing a potentially blinding disease. Although any age can be affected, including children, it is more common in those over 50. Your overall lifetime risk of developing a retinal detachment is 1 in 300, higher if you have risk factors (more on that later). And if you develop a detached retina in one eye, you have a 15% chance of it happening in your other eye. SO WHAT EXACTLY IS A RETINAL DETACHMENT? 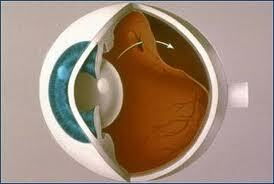 Before going to that, it is useful to have a some understanding of the anatomy of the retina. 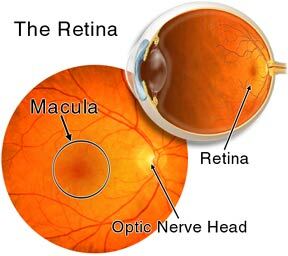 The retina is the light-sensitive innermost lining of the eyeball. 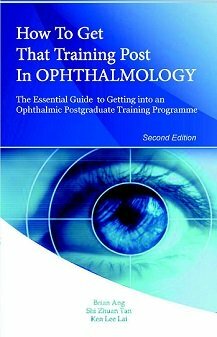 It comprises the retinal pigment epithelial layer and neurosensory retina. The retinal pigment epithelium helps to maintain and support the neurosensory retina. The neurosensory retina detects, absorbs and processes the light that enters the eye. Retinal photoreceptor cells in the neurosensory retina collect light signals and convert them to bio-electrical signals, which are then sent to the optic nerve. There are two types of photoreceptor cells: rods and cones. Rods are mainly located in the peripheral retina, and are responsible for night vision and detection of motion. Cones are concentrated at the macula (center of the retina), and are important for fine detailed vision and color vision. Damage to your macula, such as in macular degeneration, will affect your central vision. Retinal detachment occurs when the neurosensory retina peels away from the wall of the eye, much like when wallpaper peels away from the living room wall. 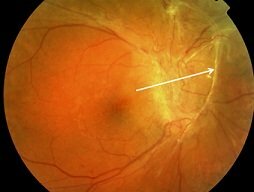 The area of the detached retina is no longer able to convert light into bio-electrical signals, and so you are not able to see what the area of affected retina allowed you to see previously. The part of your vision that is affected is directly opposite to the location of the detached retina. So for instance, if the top part of your retina is detached, then it is the bottom part of your visual field that will be lost. If your macula is also detached, you lose your visual acuity and central vision. If your entire retina is detached, you lose your entire field of vision. The gray-ish color at the top half of the picture indicates the area where the retina is detached. In this example, the detachment of the retina at the top will result in a shadow or curtain effect at the bottom half of the visual field. The macula is not detached yet, and so the central vision is spared. There are 3 main types of detachments: rhegmatogenous, exudative, and tractional. These are named according to how the retina becomes detached. Rhegmatogenous detachment: This is the most common type of detachment and occurs when there is a hole or tear in the retina that allows fluid to seep under the neurosensory retina. This fluid separates the neurosensory retina from the retinal pigment epithelium, thus causing the retina to become detached. Retinal tears occur when the retina is suddenly (and violently) pulled by the vitreous humor. This is usually due to trauma or posterior vitreous detachment. The vitreous humor is a transparent jelly-like substance that fills the vitreous cavity between the lens and the retina. With age, the vitreous humor degenerates, shrinks and separates from the retina. This process of the vitreous separating from the retina is called posterior vitreous detachment. It is a natural part of the aging process. Most of the time, it occurs gradually without any problems. However, sometimes, the vitreous tugs on the retina as it detaches, thus causing the retina to tear or break. This diagram demonstrates how a tear in the retina can cause the neurosensory retina to become detached. The retinal tear creates an opening which allows natural eye fluid to pass through (white arrow) and accumulate between the neurosensory retina and retinal pigment epithelium. This separates the 2 layers and detaches the neurosensory retina. Tractional detachment: In certain conditions, such as in proliferative diabetic retinopathy scar tissue may form on the surface of the retina. This scar tissue (white arrow) contracts and pulls on the retina. This physical traction on the retina causes the retina to become detached. 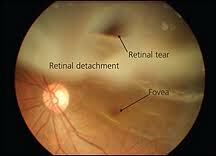 Exudative detachment: In this type of detachment, there is no break or scarring in the retina. Instead, fluid leaks out from the blood vessels of the retina and accumulates between the neurosensory retina and retinal pigment epithelium. This is an uncommon form of retinal detachment and is usually due to inflammation of the eye (such as in uveitis) or ocular tumor. How do you know you have a retinal tear or detachment? Are there any tell-tale symptoms? Yes, there are. There are 3 symptoms that you need to look out for: flashing lights, floaters, and a shadow or curtain obscuring your field of vision. Flashes or flashing lights occur when the retina is stimulated by movement and pulling by the vitreous gel. Often this is a result of gradual posterior vitreous detachment, and should therefore not have any consequences for your vision. However, flashes can also occur when your retina is torn. There is no way for you to tell whether the flashes that you experience is due to vitreous detachment or retinal tear. The only way to know is to have your retina examined through a dilated pupil by your ophthalmologist. Floaters are very common. Nearly everyone will experience floaters with time. Floaters are essentially debris or clumps of degenerated vitreous humor in the vitreous cavity. Floaters can appear as cobwebs, circles and insect legs. They will never go away, but they will never cause any problems either apart from being an annoyance. Longstanding floaters should not be a cause for concern. However, if you notice a recent and dramatic increase in floaters, then this could indicate a retinal tear or detachment. A shadow or curtain in your field of view is very suggestive of a retinal detachment. As more of the retina detaches, you will notice the shadow or curtain spreading more and extending towards the center of your vision. This shadow may move as you move your eye. If this happens, particularly together with flashes and floaters, make sure you consult your ophthalmologist as soon as possible for a full retinal examination. HOW CAN A DETACHED RETINA BE TREATED? When your retina is detached, you will need to undergo retinal surgery to reattach the neurosensory retina back onto the retinal pigment epithelium. There are 2 main types of operations: Vitrectomy reattaches the retina using an internal approach, while scleral buckling surgery reattaches the retina using an external approach. Both techniques have a high success rate if performed appropriately and early enough. The longer you leave the operation, the lower the chances of success due to scarring from proliferative vitreoretinopathy. If your detached retina is not repaired, you will lose all your vision in that eye. However, sometimes surgery may not be appropriate, such as if the detachment is an exudative detachment due to inflammation of the eye. In this instance, it is reasonable to treat with systemic steroid, similar to how uveitis is treated. 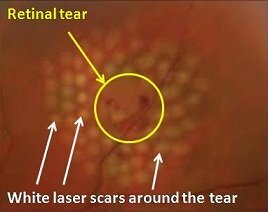 If you only have a retinal tear but no detachment, you may only need to have laser treatment. The laser is applied all around the tear. This 'fuses' the neurosensory retina with the retinal pigment epithelium, thereby sealing off the retinal tear and preventing further fluid from accumulating under the neurosensory retina. However, you may still need to undergo an operation if the tear is too large to laser or if the view is not good enough for your ophthalmologist to perform adequate laser.